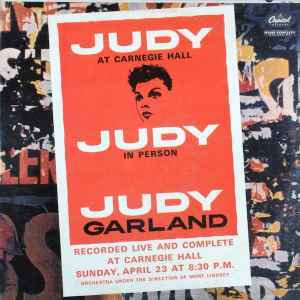 "Judy at Carnegie Hall" is a two-record live recording of a concert by Judy Garland at Carnegie Hall in New York. This concert appearance, on the night of April 23, 1961, has been called "the greatest night in show business history". The double album became a hit, both critically and commercially, charting for 73 weeks on the Billboard chart, including 13 weeks at number one, and being certified gold. It won four Grammy Awards, for Album of the Year (The first live album and the first album by a female performer to win the award. ), Best Female Vocal Performance, Best Engineered Album, and Best Album Cover. The album has never been out of print. In 2003, the album was one of 50 recordings chosen that year by the Library of Congress to be added to the National Recording Registry.